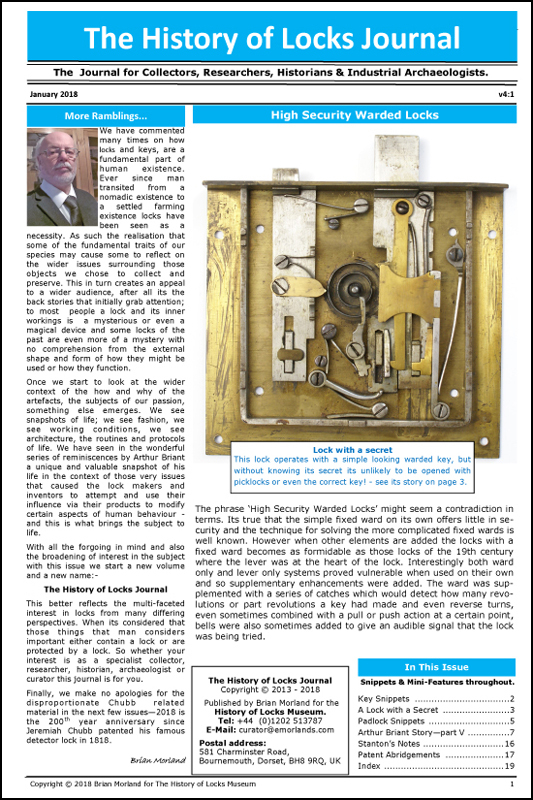 Industrial Archaeology of Locks History of Locks Museum Please support the HoL Museum Shop where you can. Researching locks from antiquity to the recent past. Maintaining a reference collection & archive. Welcome to www.antique-locks.com. You will have to register before you can post & view attachments / download images & documents. Registration is fast and free. Please also read the posts in ' What's new & forum information '. This is the place to dispose of your duplicate locks, keys and related items or to inform others of your ‘wants’. Note: On-Topic Antique & Vintage lock related collectables or parts only please. Your market place - on topic items only please. New Members Introduction-Board Help & advice-Suggestions. Rugby, UK - opening spring 2019. Updated Subject Index covering topics from v3:1 with each new issue - builds into an encyclopedic reference. Found two Patent Number for Hollymade door knob. 19-04-19, 08:40 PM in Safes, Strongrooms & Vaults. All times are GMT +1. The time now is 10:48 AM. All images on this site are copyright their respective posters and may not be used without express written permisson.